We do Shabbat School because we value Shabbat and want to come together as a whole intergenerational community! Shabbat is an important gathering time for our community. Our program serves children from kindergarten through fifth grade on Saturday mornings from 9:30 am to 12:30 pm. We begin with a thirty minute kid-friendly service which parents are strongly encouraged to attend with their children. As a young learners’ community, we engage in some singing, reflecting and praying together. After the service, the kids continue their learning with their age cohort. Our program combines formal learning with fun activities — art, play-acting, making food in our kitchen, singing, and even a little dancing once in a while! 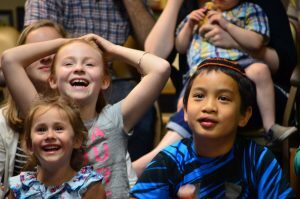 After Shabbat School, families are encouraged to join the community for our weekly delicious Shabbat Kiddush lunch which begins at 12:30pm. For more information on the mission and vision of our Youth Education Programs, please click here.